Move over Drop7. The pinnacle of mobile puzzling has a new name. I suppose it must be possible for game developers to get a sort of actor's typecasting when it comes to working within a niche. I don't like to use the word "churning" because it suggests a lack of care or quality, but Radiangames has become rather well-known for its steady stream of innovative and highly polished shooters. We've enjoyed twin-stick shooter takes on Gauntlet and a more sedate Geometry Wars and so, coming to Slydris with not even the slightest idea about what the game entailed, we were still expecting yet another finely-tuned shooter with an intriguing twist. The art is as mesmerizing as the gameplay. Instead, the developer's broken free from the safer moorings of a more familiar genre, and delivered what superficially resembles a hybrid of Tetris, Lumines, and those rather frustrating sliding tile puzzles you might have enjoyed as a child. 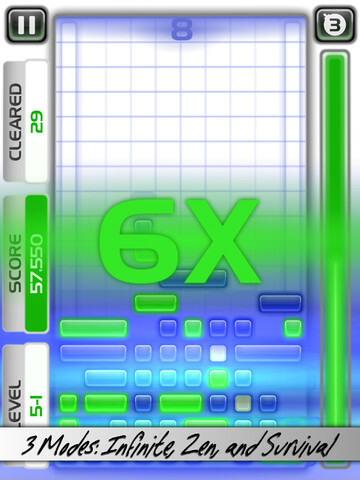 The core of the gameplay resembles Tetris in as much as blocks tumble from the top of the screen, and completed lines evaporate into your score bank. 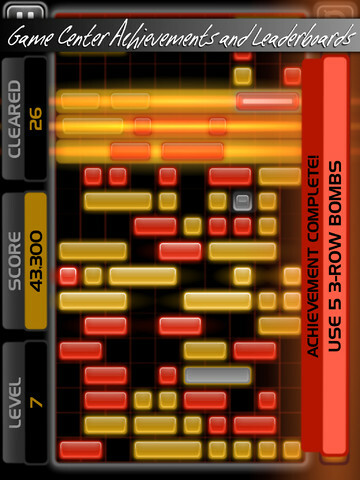 The aesthetic is pure Lumines, with chilled out electronica soundtracks and glossy blocks. In carefully sliding the tiles around the screen, you allow others to drop further downwards and (hopefully) finish off a juicy new line score. 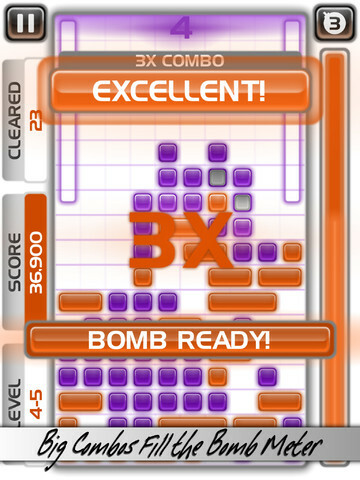 You'll need to artfully plan chain-reactions to reach the highest scores. There are three modes in the game: Infinite, Zen and Survival. Each one adds a new twist to this otherwise simplistic gameplay, and each is devilishly moreish as you constantly chase a higher and higher score. In Infinite, every time you make a single slide across the screen, a new chunk of blocks will appear at the top, so you'll need to make the most of every move. 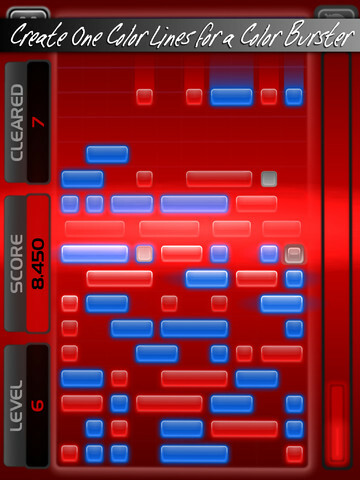 If your columns stack up too high and breach the top of the screen, your game is over. A variety of color schemes are used in the game. As the name suggests, Zen takes some of the pressure off and your session continues even after you've breached the maximum height. Intriguingly, blocks may also appear at the bottom of the screen with just a little warning beforehand. While every mode is an absolute treat, by far and away our favorite is Survival. Here, you'll be assaulted with four or five waves of blocks, then given a mere 10 seconds to re-arrange everything hastily, grab those score points and stop the stack from growing too high. As well as being incredibly satisfying, it's also the best way to learn the game and is highly recommended for newcomers with nerves of steel. Whichever game mode you choose to play in, new blocks are gradually introduced, some of which might be completely immovable, forcing an urgent revision to your strategy. Others, when triggered by a line completion, transform every clump of tiles into single units, opening up enormous scoring and chaining opportunities. Special blocks come into play as you progress through the game. It would be completely wrong to describe the game as easy to learn and tough to master because this is a challenging game in every way. An enormous amount of pre-planning is required to set up that perfect chain-reaction, and the intense excitement that accompanies the successful realization of your careful strategizing is both hypnotic and thrilling. When Tiny Wings HD was released last month, we rightly applauded the game and yet couldn't help feeling somewhat disappointed that the creative mind behind the original masterpiece hadn't chosen an entirely new project to breath some magical life into. Luke Schneider has demonstrated that no such stage-nerves affected the development of Slydris, as this is without doubt the finest puzzle game we've ever played on our mobiles. And yes, that includes Drop7. What's Hot: Incredibly deep puzzle gameplay with a huge amount of variety, delivered with Radiangames' trademark polish and attention. What's Not: That there is the sound of a tumbleweed rolling by the Modojo office.